A couple times over the past few weeks, a giant Egyptian deity has sprung up in Assassin’s Creed Origins for players to fight. In early November, it was Anubis, god of the dead. Later this month it was Sobek, the crocodile god. The gods weren’t accessible when the game launched in late October and they each only hung around for a week, then departed. Oddly, they seem to have been too powerful for most players to defeat. Anubis showed up in the game on 7 November, a little more than a week after Origins came out. Sobek popped in on 21 November. Each time, players received an alert that a new level 40 god-slaying quest was awaiting them. Quests in the game are associated with recommended player power levels, which are gained through the accumulation of experience points earned by completing missions, killing enemies and animals, ascending to lookout points and so on. Players who are under level 40 can try to fight these add-on gods, but this reporter got one-hit-killed by Sobek when taking him on as a meagre level 31. Pity the masses who are weaker than that. 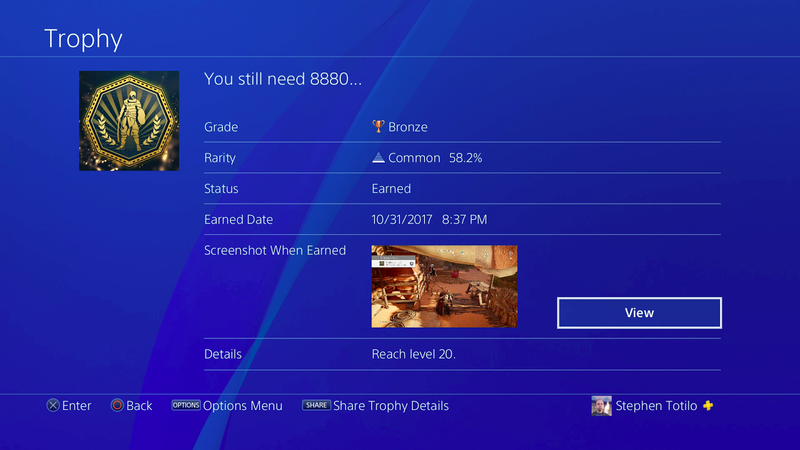 According to the game’s trophy tracking system on PlayStation 4, about four in 10 Origins players aren’t even level 20. The release of most major games these days is accompanied with an announcement of weeks or months of additional content. The message sent to players is that the game is worth getting early and then keeping (don’t sell it to CeX when you're done!). The now-standard paid Season Pass is often accompanied with a promise of a flow of smaller free add-ons. For Assassin’s Creed, the centerpiece of that free stuff was the Trials.